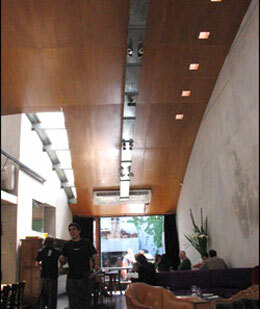 Not only did Time Out Buenos Aires recommend Bar 6, but many Argentines will recommend this restaurant as well. After eating dinner there, I fully understand why so many people like it! The ambiance is very fun, different, romantic, and city like. Time Out had mentioned the option of eating dinner while seated on couches. Therefore, when asked whether we wanted a table or couch, I figured we might as well give the couches a try! I was very glad we did. It was a pleasant experience and the food was remarkable. The décor of this restaurant is modern and trendy with lighting on the darker side. It is a fairly large restaurant, but there are not many tables. Maybe due to low seating capacity and fewer people in the restaurant, we received fantastic service. The most beautiful and great tasting bread was placed on our table with an amazing dill dip. The bread is often times dry in restaurants here, but the bread at Bar 6 was soft and fresh. The menu is full of delectable and fancy items as well. Between salmon, stuffed chicken breast, wok dishes or the all famous Argentine steak; you will have a tough decision ahead of you. In addition, the menu of drinks and wine is quite extensive in itself. They even have a section of speciality drinks made with sake. Even still, we went for a bottle of wine. Our Argentine friend picked it out, as he claimed it was amazing. It was called Luigi Bosca. Even though on the expensive side, it was worth it, as it was a hit with everyone at the table! My friend and I both had the mouth-watering stuffed chicken. It was so tender and moist that it had the consistency of fish. It was glazed with a melted brie sauce, came with asparagus and jasmine rice. It was a marvellous change after eating so much steak here. Overall, I would most definitely recommend Bar 6. It had a different atmosphere, a distinct menu, delicious food and great wine and drink choices. You could easily get away with wearing nice or business casual clothing. If anything, go to Bar 6 and use the night as an excuse to get dressed up! Most importantly, you can remind your palate what good salmon or chicken tastes like! This page rendered in 0.715 seconds.